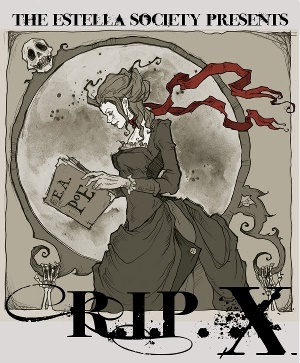 This lovely artwork is used with the kind permission of Abigail Larson. 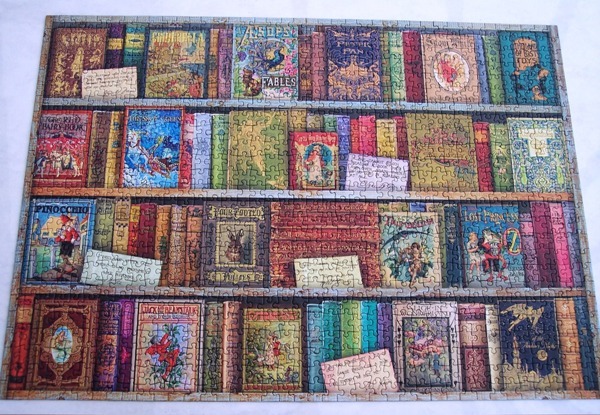 As always there are various different ways to participate, you can just read a number of novels of your choice, you can read short stories, watch films, take part in the group read and so on. Peril the short story. 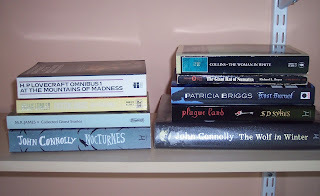 Which is to read short stories over the weekends or at other times if you prefer. 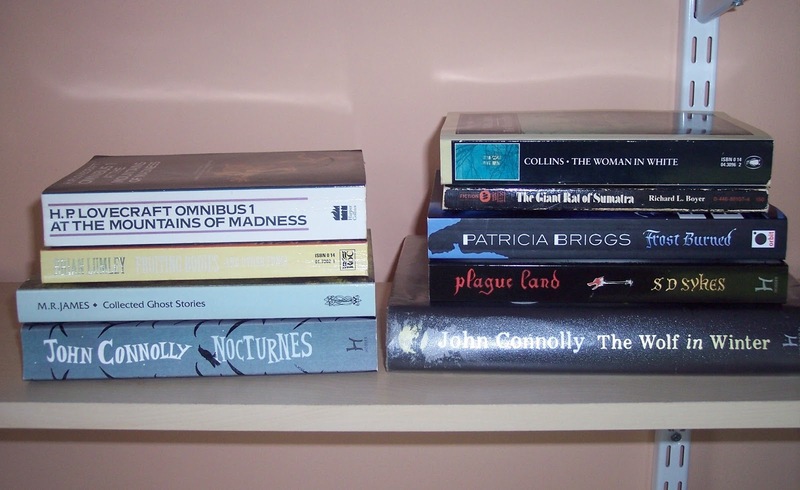 Which of these I'll get to I'm not sure, hopefully all of the novels, plus one or two that I have on my ereaders, and a reread of some of the short story volumes. We shall see. Hope everyone has a lot of fun with RIP this year and many thanks to Andi and Heather at The Estella Society for hosting. Sometimes you're just in the mood for 'gentle'... as in books that are undemanding, charming, humorous... gentle. Which is how I ended up reading a couple of Angela Thirkell books in a row. First up, August Folly. The Dean family, mother and father Rachel and Frank, and six of their nine children are coming to the Dower house for the summer. The oldest son, Laurence, 27, is to inherit the Palmer estate, the Palmers being childless. 'Organising' Mrs. Palmer is putting on a play for the village and has decided that it will be the Greek play, Hippolytus. The plan is to rope in the Dean family to act in the play and also the Tebbens, whose son and daughter, Richard and Margaret are also home for the summer. Richard is rather self-centred, his parents' golden boy, didn't work hard at university and thus got a third for his degree. Margaret has been working abroad, where she knew Laurence Dean quite well. Richard is dreading the summer with parents who annoy and embarrass him, but has reckoned without the irrepressible Deans. These Angela Thirkell novels are sheer delight from start to finish. This one had a lot of characters so it was necessary to concentrate a bit to remember who was who but even I managed to get there in the end. The story is basically a romance but Thirkell did not write in a sentimental manner about people so these stories are not soppy in any way. They're full of humour and very accurate as regards human failings. I love how Richard, in his early twenties, falls for the middle-aged mother of nine children. The eldest Dean girl, Helen, is so possessive of her brother, Laurence, that she's made miserable when he seems to be falling for Margaret. And the children in Thirkell's books are always so real... there's even a couple of mentions of Tony Morland from previous books. All in all... delightful. I have a feeling I'm going to end up with a massive collection of Angela Thirkell's books. Colin Keith is studying for the Bar but decides that he shouldn't be so dependant on his parents and takes a post as a teacher at Southbridge School for boys. The head master and his wife have two daughters, one of whom, Rose, is engaged to Philip Winter a teacher in the same house as Colin. Rose is beautiful, but far from clever. She's also flighty and likes to have the attention of every man in the room. It makes Philip edgy and unpredictable. Colin has two sisters, Lydia, still at school, and the beautiful Kate. Colin's house master, Everard Carter, falls for Kate but Kate seems to be interested in someone else. Add in two schoolboys, Eric Swan and Tony Morland from Demon in the House, now older but still irrepressible, and you have a recipe for much drama and highjinks both at school and during the holidays. This Angela Thirkell again has a 'huge' cast of characters, all of them very individual with quirks and flaws that make them very real. I always like a book set in a school so that was delightful too and it was very nice to see Tony Morland again, who hadn't changed much in the intervening five or so years. 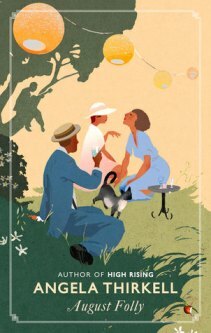 The romantic tangles and misunderstandings were of a similar nature to August Folly, at least in one instance, but as I enjoyed that aspect that was fine. Again there was a lot of humour to the fore mainly as regards the quirks in human nature. One thing strikes as you read these books, set in the 1930s, and that's how much fun the children had outdoors. Even the older ones at 16 or 17 were happy getting messy clearing out a pond or swimming in the river. And reading! Goodness they were well read. They seemed so much younger than modern kids of that age which was rather refreshing. Another super read from Angela Thirkell... I gave both books a five on Goodreads. 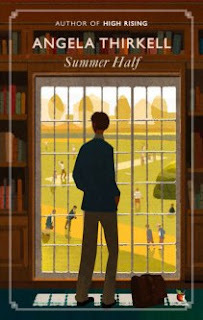 August Folly and Summer Half are my books 18 and 19 for Bev's Mount TBR 2015 challenge. My first book for August is The Wrath of Angels by John Connolly. It's book eleven in his well known 'Charlie Parker' series, about a private detective based in the state of Maine in the USA. Some years ago hunting friends Harlan Vetters and Paul Scollay came across the wreckage of a plane somewhere deep in the Great North Woods of Maine. They found inside evidence that it had been carrying a prisoner and that that prisoner might have survived. No other bodies were evident. They also found money - lots of it - and a long list of names. They took the money and Harlan also took one sheet from the list of names, leaving the rest behind. Both men have now died of old age. Harlan's daughter, Marielle, comes to see private detective, Charlie Parker, along with Paul Scollay's brother, because she knows he investigates this sort of thing. Her father had told her the whole story on his death-bed. She gives him the list her father had, clearly glad to get rid of it and the knowledge she never wanted. Charlie begins to investigate and discovers that some very odd people have also been searching for the wreckage of a plane that was never reported missing. People begin to die, among them a prominent female lawyer known to be working with Parker's enemies. He begins to wonder if his name is also on the missing list when the fact is confirmed by Epstein, a man that Charlie has worked with in his fight against the enemy they all face. Who is the beautiful woman and frightening young child who're connected to the quest for the plane and the murders? What secrets is the plane wreck hiding? And what else is loose in the Great North Woods that's scaring the locals to the point where no one will go near that area? Naturally, it's Parker's task to find some answers. Oh, Charlie Parker, how do I love thee? Let me count the ways... LOL! Seriously though this is my absolute favourite series of all time. Such a flawed man is Parker, he's firmly on the side of right but sometimes the things he has to do make you - and people in the stories - wonder. His sidekicks, gay couple Louis and Angel, are another reason I love this series so much. Like Parker they're also ambivilent personalities, very violent, assassins if the truth be known... but they too do what they do for the right reasons. Plus they inject humour - the dialogue is sometimes laugh out loud funny - into what are often very dark doings as these books come firmly into the 'horror' genre, even though they're also very much crime yarns. Make no mistake, these books are not for the faint hearted... not fun books to read at bedtime. They're seriously scary. People die horribly! 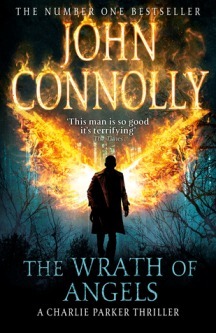 The other thing author, John Connolly, is seriously brilliant at is creating a sense of place. He's Irish so how he ever manages to transport the reader so firmly to Maine I have no idea. In this book the sense and atmosphere of The Great North Woods is palpable. I've had a fascination for it since watching The Last of the Mohicans on TV as a teen... even though I realise they never left British soil to film the thing... the 'idea' was there and that was enough. So a book set there is right up my alley and with additional extreme creepiness thrown in, well it was nigh on perfect. 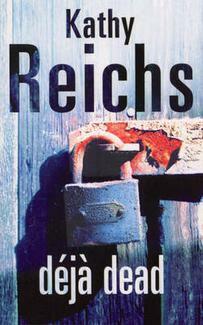 This is my first book by Kathy Reichs. She's one of those authors that I've always seen all over the place... bookshops, supermarkets, the library... and never really been tempted to try. I've no idea why. Then my daughter recommended them and offered to lend me the first book and I thought, 'Well, why not?' I gather the series 'Bones' is based on these books, but as I know nothing about that series I can't comment further on that. I can just say that I thought this was a jolly good crime read. I like crime series set in countries other than the UK so this one being set in Montreal in Canada suited me very nicely. There's a nice sense of that city, its people and its problems etc. I liked Tempe herself, a woman in her forties with a teenage daughter and all the problems that having a real life and a demanding career brings. There's quite a lot of detail of the examining of dead bodies so if that's not your bag avoid this or, do as I did, skim read. I think I may also be becoming allergic to metaphors as they're sprinkled like confetti all through the story, and it's intrusive. Regardless... this is a good intro to a 'new to me series' and I will definitely grab more of my daughter's books at some stage. 37. 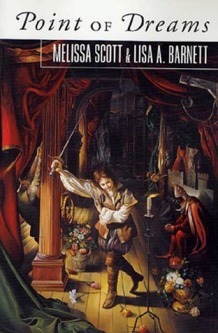 Point of Dreams by Melissa Scott and Lisa A. Barnett. The Alphabet of Desire is the new play that's been chosen as the midwinter masque in the city of Astrient. Philip Eslingen, newly dismissed from his job, gets a new position at the theatre teaching military drill to the chorus of the play. When the dead body of one of the chorus is found on the stage, Philip's lover, Nico Rathe, Adjunct Point at nearby Point of Dreams is called in to investigate. Several more deaths follow with no clues as to who the perpetrator is or motives for the murders. Is it political intrigue or something far more basic? One thing's for certain, neither man has any idea of the personal danger they're putting themselves into to investigate these crimes. So far in this series I've read one book, Point of Hopes, one novella, Point of Knives, and now Point of Dreams which is officially book 2 I believe. The books are basically a crime series based in a fantasy world where astrology is real. My link to Point of Hopes reveals more about the setting of Astrient so I won't repeat myself here, suffice to say the world-building in the series is very good indeed. I'm not mad about theatre settings in stories I have to admit, I find some of the detail of the plays a bit tedious, rehersals and so on. That's why I gave it a four on Goodreads rather than a five. I do enjoy the relationship between Philip and Nico and I also like the fact that this is a world where the sexes are equal and all kinds of sexuality are the norm. Also an interesting aspect of this particular story was the use of flowers as magical instruments... very interesting and original. All in all a very good read. Good series. Point of Dream is my book 17 for Bev's Mount TBR 2015 challenge. I seem to have specialised in crime books this month, although admittedly one was a fantasy/crime story... it was still basically a crime yarn. 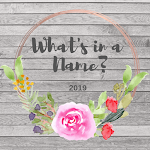 It's been an odd month with mild illness, family things going on etc. so it's been nice to relax in quiet moments with a bit of murder and mayhem. I don't have a favourite book this month. All four books were equally good and fun and if August is similar then I shan't complain.